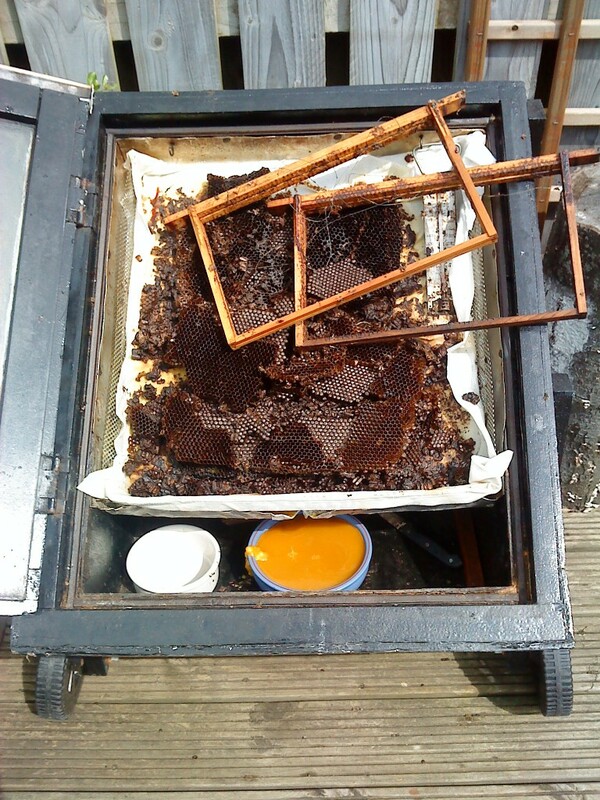 Solar extractor with sterilised frames, old cappings and a beautiful cake of wax. 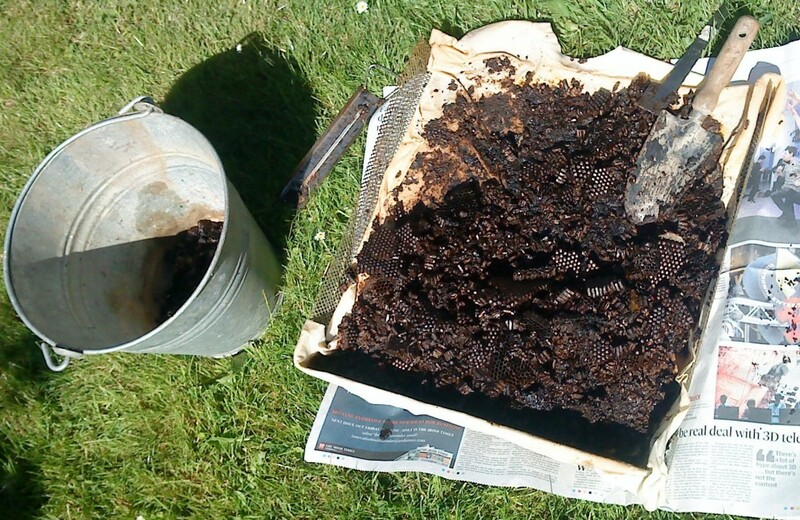 Time to throw the cappings in the compost and replace the filter with a clean one. In 2004 I built a solar wax extractor. The design was based on what I could find on the internet at the time, for example the ‘encyclopaedia Cushmanica‘ and good advice from beekeeping friends, both in Dublin and on the Irish beekeeping discussion group. Here, eight years on, is what I have learned about building and using one. Disclaimer: hot wax can burn, and wax is highly flammable. DIY is not without risks. Do all of this at your own risk! Before you start, it is good to think about how you will use your solar wax extractor. Will it stay in the same place year round or will it need to be moved to make space or stored away for winter? How many hives do you have? How often will you visit the extractor? I have found that my extractor, which I keep in our back garden in Dublin, is sufficient for my needs, with 8 honeybee colonies. Over a good summer I’ve easily processed every frame I’ve found an excuse to put in it, plus my backlog, plus all the old combs of a friend. If the spring/summer/autumn climate was warmer or sunnier, or if I did not go to work five days a week, I could process a lot more wax though this extractor. If the extract was at an out-apiary and I only visited it when I saw my bees, throughput would be much less. It renders used beeswax into handy cakes. These I exchange for fresh foundation from Ben Harden, or I store for the day when I get into candlemaking. The cakes of wax are not fully clean, as will be explained. It partially cleans cleans and (when the temperature gets properly hot) sterilises frames. Moreover it is most satisfying that all the energy costs come from the sun! A double-skinned box, made of plywood with fibreglass insulation between the inner and outer box. 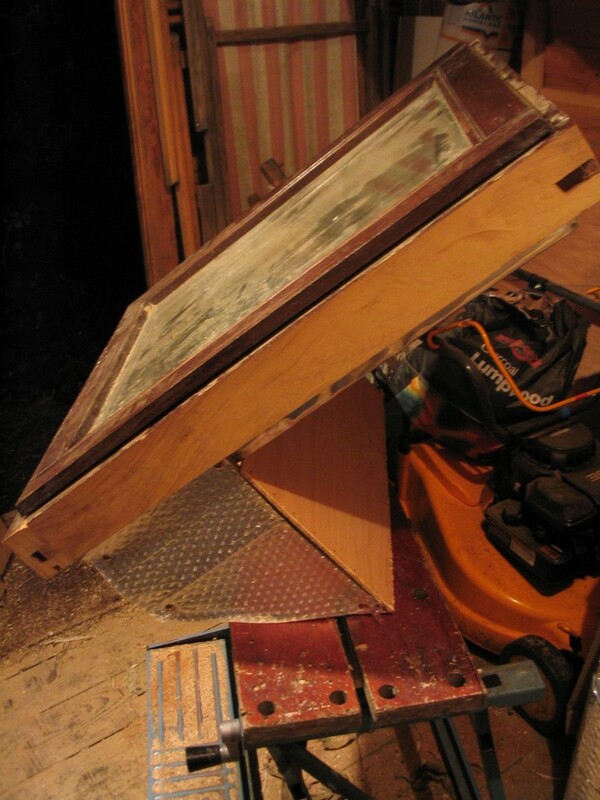 The inner box was built off the inside of the window frame. The outer box is made of marine ply, and is built off the outside of the casement. 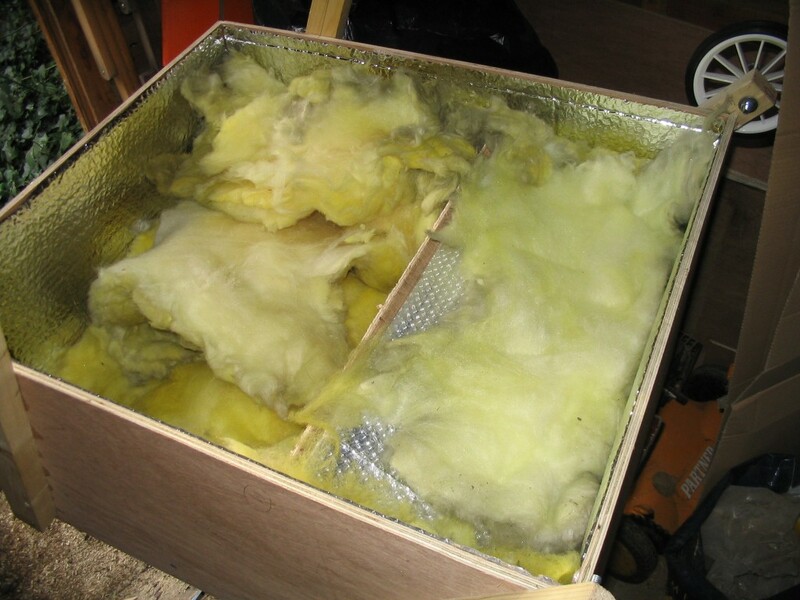 Fibregless and bubble foil insulation were put in the space between the two boxes. The inner box is shaped to hold an aluminium tray. Along the bottom edge of the tray is a notch for the wax to drip out through. Below the tray is a space where the the receptacle that catches the molten wax goes. In the aluminium tray goes a removable mesh tray (made from expanded metal), raised slightly up off the tray floor with short bolts. Inner mesh tray with old cocoons ready for the compost. Note t-shirt filter. Fixed around the inside of the the mesh tray is a cloth filter (usually an old t-shirt, cut in half up the sides and across the shoulders) in which I deposit the wax. The whole assembly is painted black to maximise absorption and is mounted on four legs, two of which have wheels. The original white wheels shown in a picture further up proved unsuitable for the weight of the extractor on the terrain, so I used these larger black ones (from a gas barbecue that my brother-in-law had helpfully abandoned in our garden) instead. 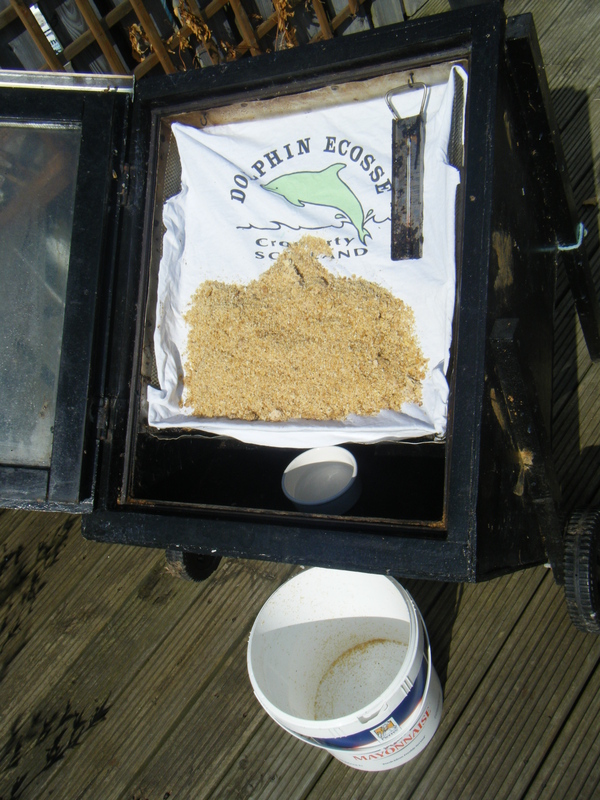 Washed cappings awaiting melting, in a new t-shirt filter. It processes cappings (they tend to get a fresh t-shirt filter), brace & burr comb, super comb and brood comb. I like to wash cappings first to remove most of the honey. You will see an oven thermometer belonging to my brother’s ex-wife. That works well, but the extractor doesn’t really need one. I’ve recorded temperatures up to 120C (therefore anything in or near the heating area needs to be heat-proof, and you need to keep children away on sunny days). I chose the angle of the tray by looking up on the internet the correct angle for solar water heaters. Almost all solid impurities are filtered out by the cloth filter – and the wax seems to flow down in 2 ways – down the front of the cloth to the bottom where it passes thru the cloth at the bottom, and straight thru the cloth & the mesh and then down the alu tray behind. Once the cloth filter gets dirty I replace it and use the old one (with most of the wax melted out of it) as a firelighter in the stove. This works well for me. I try to remove frames while they are still warm (but not too hot, ideally) because the residue sets solid when cold. I use the knife to scrape the worst of any adhering cocoons or propolis off them, then they’re ready for more foundation. Gloves are good because the residue can be a) hot & b) very sticky. Manky brood frames then get cleaned sterilised in caustic soda & boiling water. The cocoons that are left after melting old brood combs go onto the compost, once I’ve removed the wires. Every autumn the extractor gets put away at the bottom of the garden with a plastic sheet over it. When the extractor gets wheeled back up and put on the deck it’s a sign in our house that spring is here. The extractor is scrubbed and cleaned with boiling water before use. I made the inner tray wide and long enough to fit a queen excluder in, on the advice of my friend Joe Kelly. However, I’m not too happy about the effects on the wooden joints of the metal expanding in the heat, so I tend not to use it for queen excluders. Still, it’s useful to have a big extractor – useful for cleaning my travelling screen and so on. I collect the wax in old pyrex dishes or pots with a few mm of water in. The idea of the water is to dissolve the honey out of the wax, but the collection pot rarely seems to get hot enough for the wax to be liquid by the time it arrives down there. Pyrex dishes are used instead of the bread tin that you see in the picture because they don’t rust. I get the wax out by pouring hot water on the underneath of the dish, or by putting the dish in the freezer. My pyrex dishes come from the charity shops or the bric a brac stand at my local church fair, not from our kitchen! Having the door is hinged at the side seems to be right. It may want a string or a prop to hold it open. As you will see in the top picture, I keep an old knife in the collection area for prising stuff out and cleaning frames. The extractor works on sunny days from about April to October. I keep others’ wax separate because of disease & so I know whose pot of wax is whose. With my solar extractor, the solid impurities are nearly all removed by the t-shirt filter but one ends up with residues of honey left in the wax. This means I need to process the wax a second time to wash out the impurities. I should point out that many of the smarter ideas come from other beekeepers (thanks all). The extractor has done its work – the wax has melted and run trough the filter, from the tray and into the pot below. Note the residue left on the t-shirt filter. Either side of the pot that received the wax are two more that I made earlier. Does it really need a double-skinned box? I think so, but I’m not sure. It probably keeps the temperature up on sunny/cloudy days. The lip at the bottom of the inner tray is horizontal. It would be better to have a slight gradient from the sides to the centre, by shaping the lip into a slight V.
I’d put the wheels on a proper axle. Just mounting each wheel on a bolt is probably not strong enough. I’d fit a handle for pulling it round the garden, or even fit it into an old wheelbarrow chassis. I’d try to make a box that wasn’t as deep. It’s very bulky (which means heavy) & it doesn’t need to be that big. When it rains (it does that a lot round here), water can get in thru the window seals and into the inner box. I added a lip on the window just above the top of the door and I built up the botton of the window with silicone sealant, which seems to have done the trick. 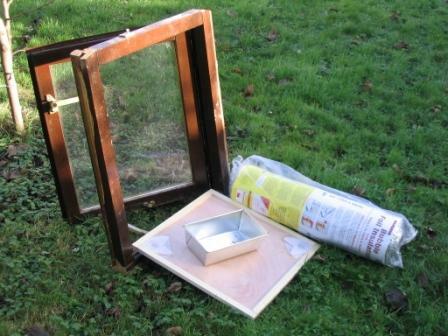 Perhaps a better design might be to get a double-glazed window pane, not in a frame, that is bigger than the box and lies on top of the box so there are no seals/joints at the front. The rain getting in has meant that some of the marine ply has got rotten. I wish I’d put extra effort into weatherproofing it, but perhaps it goes with the territory. The fibreglass in the space between the inner & outer boxes is probably fairly superfluous – it doesn’t seem to get hot enough down there to really matter much. Oh, and I’d move to live somewhere sunnier. One problem with this design seems to be that the wax needs to be liquid to pass thru the t-shirt filter, and the top of the extractor seems to get a lot hotter than the bottom, so it can get discoloured by heat before it makes it into the tray. One day I may experiment with leaving out the t-shirt and collecting wax with solid impurities in it, to see if that improves the overall colour of the wax. I think if I made the bottom edge of the alu / mesh trays about 50-75mm higher up the box and made the inner box smaller, this might make it it warmer down below and possibly solve the problem. I’ve been musing on the idea of a wall-mounted extractor. It would swivel on gate hinges, and be angled much more to the vertical. It would need to be smaller, but might be more suitable for a smaller garden. Perhaos it would tuck away when not in use. My next challenge is to get the honey residue out of the wax cakes, then someday I might make candles. When I do that, I might use the solar extractor as a third stage to re-filter the wax thru gauze to take out the final few impurities. Here is a different extractor design – a single-skinned bof with insulation inside. Thanks David! One beekeeper mounted his solar extractor on an old swivel chair. It must have been a smaler & lighter extractor design than mine, but it sounds ideal for flat ground. Another beekeeper recommends using a lid of corotherm polycarbonate. I’ve no idea what heat the polycarbonate will support, but he reports that his works well. There has been a good discussion based on this post, in the ‘Beekeeping worldwide’ group on Linkedin. 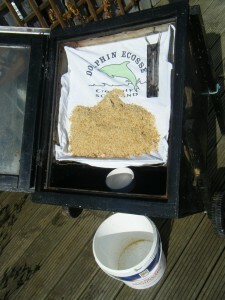 One contributor uses a metal barrel cut in half, and another suggested these plans for a solar wax extractor. 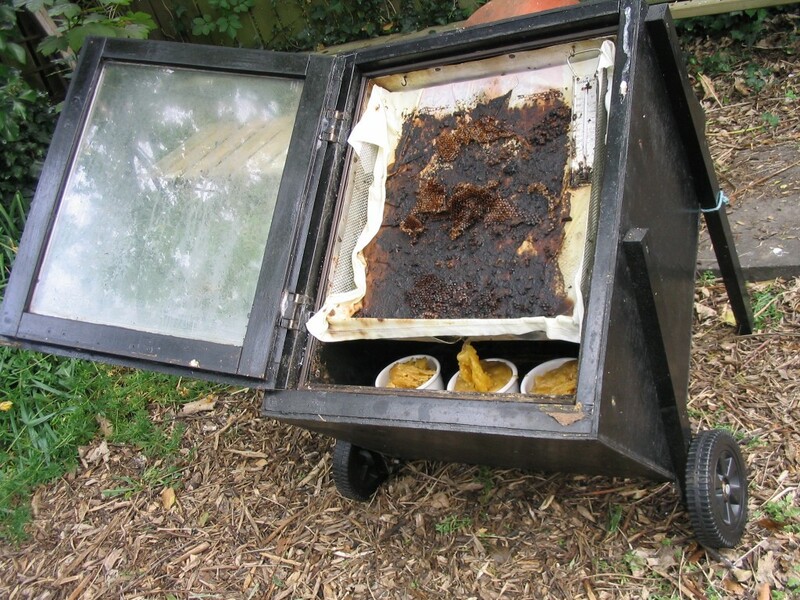 This entry was posted in Beekeeping and tagged Beekeeping on January 15, 2012 by Simon Rees. I don’t use a filter under my frames. It is amazing how the gunk stays up in the tray and only the wax drips through the 3 little holes. My tray is at an angle to help the flow. I like your double walls. If I get another one made, I want double walls! I think it would be more efficient then especially on cooler days. I also like your wheels. I stand mine in a garden cart so I can move it around but then sometimes I need the cart for other things! The guy that built mine found a large, heavy stainless steel serving pan at a recycle center and then built the box to make it fit. I do have a prop to hold up the lid and think that is good. Thanks for sharing yours! I Googleed into your site and was so impressed by your drawings on solar-wax extractor. I will try and see what i can make out of it and report back to you again. The Technical Centre for Agricultural and Rural Cooperation (CTA) was established in 1983 under the Lomé Convention between the African, Caribbean and Pacific (ACP) Group of States and the European Union Member States. CTA’s tasks are to develop and provide services that improve access to information for agricultural and rural development, and to strengthen the capacity of ACP countries to produce, acquire, exchange and utilise information in this area. This book is part of that service and is available free to people from ACP countries who sign up to receive credit points from CTA. Details of other books in this series are available at http://publications.cta.int/en/publications/series/opportunities-in-food-processing/. I am requesting permission to reproduce the above photograph in all editions and formats related to the book, including electronic editions and applications including database and online publication, for the duration of the publication and in print and online advertising and marketing materials promoting the book. Thank you for your help. If you have any questions please call me on +44 (0)1788 823662 or email me at pfellows@btinternet.com. Regarding the heat variation in your box, I am thinking a small solar powered fan fitted in side the box may circulate the air and create a more even temperature throughout the box.